I've always wondered why they call it Trollville! 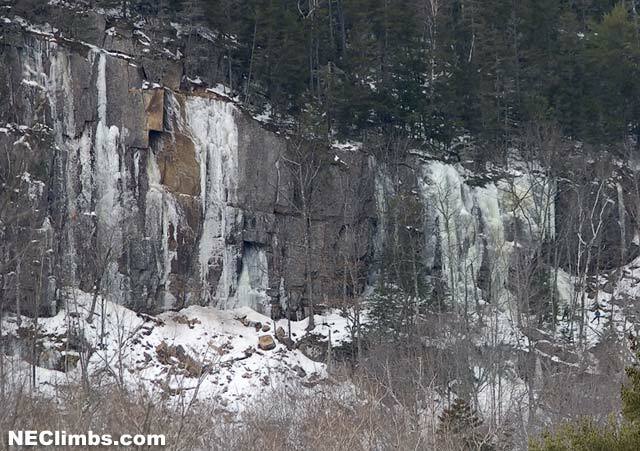 Description: Another of those small but popular climbing areas in New England. It was first explored by local legent John Tremblay and Kurt Winkler in the 80's. Mark Synnott's mixed efforts there from and the segment on his testpiece Manchurian, featured in Robert Frost's movie Uncommon Ground video, made it a popular place for the hard climbers. A huge rockfall in 2002 destroyed Manchurian, Guido's and many of the harder mixed routes on the left side of the crag. Directions: Drive to jackson Village. Trollville is the obvious crag seen directly across the road form the Jackson covered bridge on Rt. 16. Access is in question so be considerate of the neighbors. Park in a plowed area left of the entrance to the town dump. You can probably hike in via a trail at the back of the power station. DO NOT park at the power station or in the restraunt parking lot!